If you’re writing a story about supernatural dangers, you don’t want things ending in the first few pages, so the characters may need some reliable ways to defend themselves. Folklore and legend are chock full of various ways to do this, so per a reader request, I’ve spent the last week digging up some good ones for your use. These remedies and protections can be played in a lot of different ways in a story. Sure, you could use them as described, but you could also just make them a point of cultural interest, or use their symbolism in a story otherwise devoid of magic. You could undermine them as well, foreshadowing the one crucial defense against a monster, only for the hero to find out it’s all a lot of hot air at the worst possible time. Plus, if you want to create some original otherwordly threat for your story, these might be a good jumping off point for creating your own defenses against it. Angelica: There’s a widespread folktale in Northern Europe that the Archangel Michael introduced this plant to humanity as a form of medicine. Due to Michael’s role in throwing down Satan, it was also thought to offer a general purpose defense against Judeo-Christian demons. Arbutus: In Roman folklore, this plant warded off strixes, nocturnal owl-monsters that preyed on sleeping babies. You were supposed to brush a sprig of arbutus on the threshold and windowsills of a house, thereby blocking a strix’s entrance. Ash: In New Zealand, Maori folklore describes the Patupairehe, a race of red haired fairy-like spirits. They weren’t generally dangerous, but anybody who heard their enchanted flute music would fall under their spell. Ash and any food that had been cooked in a fire would scare them off. Bells: Bells, especially church bells, have a long history of scaring off various creatures in the folklore of Northern Europe. Aufhockers, a type of evil spirit from Germany, would disappear the second they heard them. However, bells would enrage Scandinavian trolls, who hated loud noises. Boiling Eggshells: This is a well known way to reveal changelings, withered old fairies left behind in the form of a baby when the real one had been stolen. Boiling eggshells in front of a changeling confused it, causing it to speak out in surprise like an adult. At this point more permanent remedies could be used. Such remedies might involve burning the baby with a red-hot shovel, so one generally wanted to be sure. Copper pans: In China banging copper pans together was supposed to scare off evil spirits (usually known as kuei or guei), though this was a fairly weak deterrent. If the demons were determined, it would make no difference. Daisies: A daisy chain hung around an infant’s neck was also used as a protection against changelings. Fennel: As detailed in my series on vampires, fennel and millet (or any sort of seed from a domesticated plant, really) were a good foil for the monsters. Scatter some fennel about your house, and the vampire would be compelled to devour each grain, keeping it busy until sunrise, when it would have to flee. Dried peas had a similar effect on the Japanese demon-ogres known as oni. Fire (and lots of it): Is it surprising that fire would be a first choice against many supernatural threats? After all, it destroys things so thoroughly, and mankind has been using it to scare off dangerous animals since time immemorial. Fire frightens many otherworldy beings, but it is essential for the destruction of vampires, wendigoes, and draugar. Firecrackers: Gunpowder explosions were traditionally thought to scare off demons in China. In the modern day, firecrackers are the go-to method, and this is why they’re set off during the Chinese New Year. They are particularly good at keeping away the Nian, a horrible monster who lives under the sea and comes ashore to prey on humans each year. Fresh water: In Scotland there’s a particular grouping of evil fairy spirits collectively referred to as the fuath, a word that means “hate.” One of the most dreaded of all is the Nuckelavee, who comes out of the ocean and spreads pestilence. His saltwater nature makes him vulnerable to fresh water, which he can’t cross. Splashing the Nuckelavee with fresh water will cause him to retreat. Garlic: The strong odor of garlic has been reputed to drive away evil spirits and witches for centuries, though it’s most famously used against vampires. This is a classic bit of folklore, borne out through the ages. Gold: An ill-omened Irish spirit, the Dullahan is a headless horseman who probably inspired Washington Irving’s The Legend of Sleepy Hollow. Throwing gold at him or in his path causes him to vanish instantly. Gold is also helpful against the Norse sea goddess Rán. I mean, she’ll still drown you, but if you present her with gold you’ll get a slightly cushier afterlife. Graveyard Mould: If it was taken from the hallowed ground of a churchyard, this was thought to be repellent to fairies. It could be thrown at them to drive them away, or spread it on the ground to block their approach. Incense: The smell of burning incense was a good deterrent against harmful spirits in the Middle East and Asia, mainly against djinn and guei. Inside-Out Clothes: Turning your clothes inside out (including switching which feet your shoes were on) was supposed to make you invisible to certain spirit-beings, such as pixies, leshii, and fairies in general. In some cases, simply turning your coat was supposed to be enough. Iron: Iron is one of the greatest supernatural wards in history, used throughout Europe, the Middle East, and Africa to drive away things that go bump in the night. There’s much debate on what kind of iron works best: wrought or unwrought, whether an alloy like steel still counts, or if iron ore fallen from the sky in the form of a meteor was better, etc, etc. Pure, normal iron fashioned into a useful tool or weapon seems the most reliable choice. It’s effective against demons, djinn, fairies (except for the goblins called redcaps, who are notably immune), ghosts, vampires, and sundry other minor spirits and demons . Sometimes they’ll go away if you just touch or brandish iron, and in other cases only iron weapons can hurt them. This is also where the tradition of putting an iron horseshoe over a doorway comes from, as it protected the entrance from such malignant beings. Magic Circle: In Europe and the Middle East, magicians would draw or etch a circle in the ground around their feet before summoning a ghost or demon. So long as the magician remained in the circle, and the circle was unbroken, it would protect them against any such evil spirit, forming a magical barrier. Often the circle had to be marked with a ritually purified object, or made out of something else with protective properties, like salt. Mirrors: Mirrors have been surrounded by magical beliefs for a long time. Breaking one gives you seven years bad luck, if you didn’t cover the mirrors during a funeral you might see your own ghost in one, you get the idea. At the same time, mirrors show the true nature of things. The old cliché about vampires not showing up in mirrors doesn’t exist in folklore, but in Asia it was a believed that if a demon saw its face in a mirror, it would be forced to flee. For example, if a Japanese kitsune spirit was disguised as a human, showing its face to it in a mirror would reveal the face of a fox, breaking any spells the spirit had cast, before forcing it to turn back into an animal and flee. Need Fires: A traditional Slavic ritual that consisted of building two great bonfires on either side of the crossroads near a town at night, then extinguishing all other light for miles around. 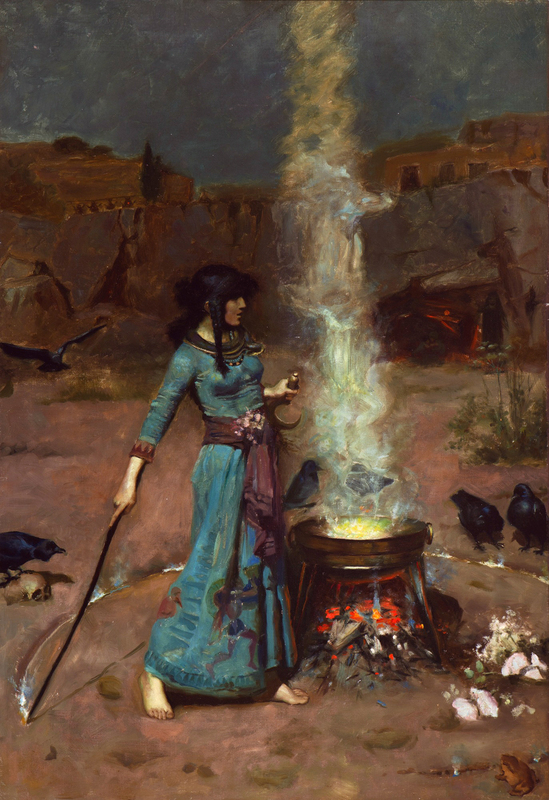 People and animals would be led between the fires, granting protection against plague, vampires, and witchcraft. This was very useful for getting rid of a horrible parasitic spirit called an ustrel, which was the ghost of an unbaptized baby that lived inside cattle. Unfortunately, the entire ritual is ruined if any other human-made light exists nearby, even a single match. Offerings: While the most dangerous spirits and monsters pretty much needed to be destroyed or sent packing, lesser ones could be placated. Many types of fairies could be pacified with offerings of milk or cream, the Russian rusalka left you alone if you put out eggs and garland wreaths for it, while mermen would be appeased if you lit candles for them. The precise offering differed from case to case and needed to be well researched; the wrong kind of offering might enrage a spirit. Peonies: According to Greek folklore, this flower would shine in the dark when evil was near, and was used by farmers and shepherds to protect their flocks from prowling spirits of the night. Prayer: When all else fails, pray—sometimes it works. Invoking the name of God against demons, djinn, and other noisome entities was often a reliable fallback. Unfortunately, it sometimes depended on how pious you were. There’s a few stories of saints defeating dragons with their faith, but that sort of thing doesn’t work for everybody. There’s also the added wrinkle that prayer was more effective against demons and monsters who lived in regions where the worship of your chosen deity was the norm, and less so elsewhere. After all, that vampire probably isn’t going to be impressed if you call on Shiva. Red: As in the color, reputed to be the color of the devil in medieval Europe. The exact reasoning is lost to time, but the color red was supposed to be repulsive to certain supernatural entities, notably the Patupairehe of New Zealand and the wood-wives of Germany and Scandinavia. Wearing red clothes or tying a red string around entryways to your house worked, and certain plants like red verbena carried similar properties. Religious Symbols: An old standard, religious symbols mainly worked for guarding against something, as opposed to an active offense. Waving a bible three times over a baby’s crib protected it against changelings, a medallion or statuette of the demon Pazuzu was proof against other Mesopotamian demons, carving a cross in your door protected your home against vampires, and reciting from the Koran would drive off djinn. Ringdoves: The fearsome Persian karkadann, alternatively described as a huge rhino-like monster or a horned wolf-like monster, would fall into a stupor if it heard ringdoves singing. Rosemary: Supposed to be an effective charm against Judeo-Christian demons. You simply wear a spring of it around your neck, but if the plant is plucked by someone who isn’t pure of heart, the magic is lost. Rowan: Wood from certain trees was often thought to have magical attributes. Rowan wood in particular was good for fending off evil. Carving your doorway out of rowan prevented witches from entering, a wooden stake made from rowan was thought to be more efficient for keeping vampires pinned in their coffins, and a rowan walking stick or a few rowan berries were sure protection in fairy-haunted regions. Running Water: Running water is more pure than stagnant water, and has been a safeguard against supernatural evil for a long time. Vampires, the Nuckelavee, the dodo of Ghana, ifrits, The Brown Man of the Moors, and many other beings couldn’t cross a trickling stream to pursue you. Conversely, Scottish kelpies lived in running water, but feared still water, such as puddles. Salt: Much like running water, salt has symbolic connections with purity, both for its white color and its historical use in preserving food. Even today, the superstition of throwing salt over your shoulder to ward off bad luck endures. Salt would drive away Arabian spirits and monsters, like djinn or the palis, sprinkling salt over a baby’s crib protected against thieving fairies, and throwing salt on the French werewolf known as a loup garou would cause it to catch fire. Self-Bored Stones: By which I mean stones found in a river or stream bed that have had an unbroken hole eroded in them. Looking through this hole allowed you to see past a fairy’s glamour. If you hung it around your neck it served as an amulet against fairy magic, and looping some iron through the hole made it more potent. St. John’s Wort: This plant is a good ward against the skrogga, a Swedish wood-wife spirit. Sunlight: Sunlight is a classic bane of all things evil or supernatural. Many eldritch beings were simply nocturnal, but on others daylight had very dramatic effects. Vampires caught in the sun would be rendered inanimate corpses till nightfall, trolls and dwarves exposed to sunlight would turn to stone, while German aufhockers and the duergar of Northumberland would vanish at dawn. Tar: The smell of tar irritated the djinn of Arabia, and if a djinni possessed somebody one of the remedies was to rub their bodies with fresh tar. The Fig: This refers not to the fruit, but to a particular hand gesture used to protect against evil and bad luck. Originating in the Middle East, it’s formed by folding your thumb between the index and middle finger, then making a fist, as if playing the childhood “got your nose!” game. Particular useful against the Judaic demons called shedim, but it will also offend them greatly so, you know, be careful. True Name: There’s an old idea in Eurasian cultures that knowing somebody (or some thing’s) proper name gives you power over it. Christian exorcism requires a priest to learn the possessing demon’s name before he can cast it out, reciting the name of a German nixie or nokk three times will prevent it from harming you, and in one legend calling a troll by its true name killed it instantly. Vermilion: The color vermilion, like the color red, was a supernatural deterrent. It was particularly efficacious against the demons of Hell, and when painting a Magic Circle on the ground as a defense, vermilion paint was always recommended. Awesome! I can definitely use some of these in my YA series. Thanks so much for researching this!